When you face various deck equipment challenges, making the right lubricant selection can help lower labor costs, extend the life of the equipment, improve safety and more. The key is to identify deck equipment stresses, then apply the optimum lubricant solution. A trained lubricant specialist has the knowledge to relieve problems and significantly lower your total operating costs. That’s because selecting a specialty lubricant that can maximize the performance of a given deck application brings many benefits, including: minimizing wear and damage to moving parts, improving corrosion protection, reducing consumption of the lubricant, extending operating temperatures, increasing energy efficiency and reducing lubricant disposal costs. Here are five stress areas worth considering. a. Premature wear can occur if the grease is not up to the design loads and speed of the equipment. o Today’s deck equipment is being pushed much harder over a wider range of operations, resulting in higher loads on gears and bearings that are rotating faster. Advanced, high-performance grease formulations are designed to handle today’s more demanding conditions. o Commonly used thick asphaltic grease will slide off the vertical face of the slewing gear on deck cranes. Alternatives can provide a thin layer, which stays in place, improving longevity and safety on deck. o Softer grease with the correct additives often performs better than older thicker types. Depending on the situation, the lubricant must either separate contact points with a film or deliver additives that maintain anti-friction benefits even when squeezed out at the point of contact. o Temperature changes can affect grease performance; grease that is good for the tropics may not flow through the auto-lube system in northern climates. d. Eco-friendly characteristics are required when lubricants eventually wash out to sea. This necessitates formulations that are as good in performance in deck equipment as they are for the environment. a. When gears are improperly lubricated, damage can occur in the form of abrasion or wear, pitting caused by heat and welding together of the two surfaces, or micro pitting caused by metal fatigue. The proper gear-oil additives combined with synthetic oils can reduce wear and damage caused by metal-to-metal contact under repeated and extreme pressure. b. Matching the correct viscosity to the manufacturer’s specification is, of course, a good place to start. But knowing how well the lubricant maintains its viscosity over repeated use is also important. c. Different types of additives and base oils can be matched to the type of gear set to minimize damage from rolling or sliding friction. 3. Hydraulic systems are another area to look for improvements based on the type of lubricant chosen. Selecting a hydraulic oil that has good resistance to oxidation and hydrolysis will lengthen the time between oil changes. 4. Chain drives are frequently used on vessels in rail systems and winch systems. Here the goal is to deliver the lubricant to the pin and bushing of the chain link while also preventing the lubricant from washing away during rain and heavy sea events. A highly viscous chain oil diluted with an evaporating solvent may prove to be your best lubricant system. 5. Systems exposed to harsh chemicals – such as LNG or refined petroleum products – may require lubricants created from PFPE base oils and thickeners. These products have very high resistance to thermal breakdown and are inert when exposed to harsh environments. Switching to a PFPE-type lubricant can increase the time between overhauls from months to years. The savings in labor and material can be substantial. When assessing the requirements for a lubricant, a lubricant engineer will investigate the speed, temperature, size, pressure and environmental conditions of the mechanical element in use. 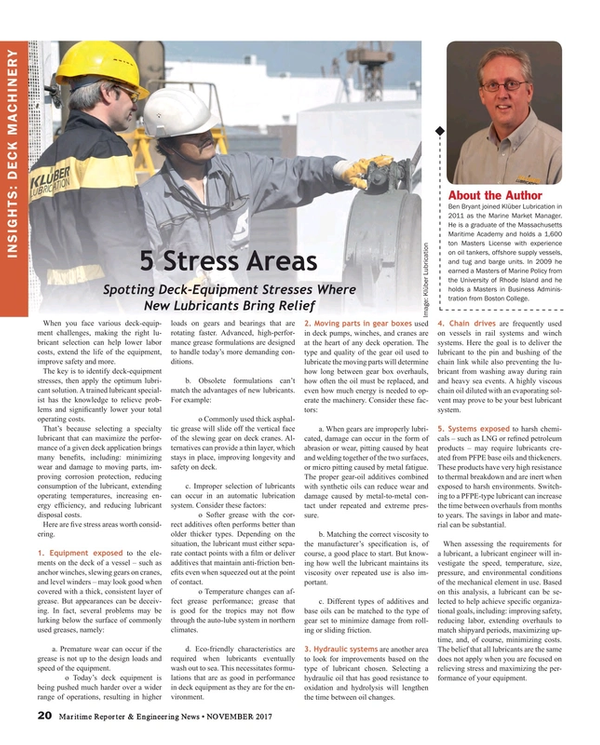 Based on this analysis, a lubricant can be selected to help achieve specific organizational goals, including: improving safety, reducing labor, extending overhauls to match shipyard periods, maximizing uptime and, of course, minimizing costs. The belief that all lubricants are the same does not apply when you are focused on relieving stress and maximizing the performance of your equipment. Ben Bryant joined Klüber Lubrication in 2011 as the Marine Market Manager. He is a graduate of the Massachusetts Maritime Academy and holds a 1,600 ton Masters License with experience on oil tankers, offshore supply vessels, and tug and barge units. In 2009 he earned a Masters of Marine Policy from the University of Rhode Island and he holds a Masters in Business Administration from Boston College.